So, I went for another doctor’s appointment today and saw Dr. Bindner. She is our favorite. When you go to see her, you don’t have to wait, she’s down to earth, she knowledgeable, and she’s excellent with the doppler and the ultrasound machine. Again today, I was asked to undress from the waist down. I am pretty sure that’s not going to change. Apparently the closer you get to actually birthing the baby, the less clothes you get to keep on during your appointments. She first checked my cervix and said that it wasn’t even close to being ready. So, unless something happens very quickly, Davis is going to be continuing to grow for awhile. Which leads to the second point. I told her I felt like I could feel the baby from the tip top of my uterus all the way to the very bottom. She said it could be because of my petite stature, but she thought it looked as if he was going to be a big baby. Just to make sure, she offered to do yet another ultrasound. After making sure that it would be covered by my insurance, we agreed to have it done and were ushered into the ultrasound room. Dr. Bindner began by measuring the head. She said, “Oh he has a big head.” I asked if that was bad. She said no, it probably just meant what we expected – he was going to be a big boy. She did some other measurements then began looking to see if we could see his face. This doctor is so good with the ultrasound machine. 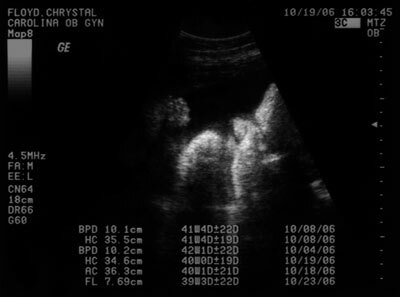 She’s the one who got the awesome profile shot at 20 weeks. Not only could we see his face, but we could see him sucking his thumb. We could actually see his lips moving! Amazing! Seeing that made me ready to meet Davis for real. I think she was as excited as we were about being able to see his hand in his mouth. But, back to the real reason we were in the ultrasound room once again. We were checking to see if Davis was supersized. Sure enough, when she printed out the ultrasound weight prediction it proved what we suspected. Davis is apparently going to be a “Hoss!” This was the doctor’s word – not mine. She said that the projected weight is 8 pounds and 15 ounces. Oh my! Before she did the ultrasound I asked her how far they would let me go past my due date. She said no longer than two weeks because of the placenta deteriorating. However, after the ultrasound, she changed her answer and said they wouldn’t want me to go past my 40 week due date because of Davis’s size. The one pitfall is that she suspects I may have to have a C-section. They aren’t scheduling one or anything. She wants to let labor progress naturally and try a vaginal delivery first. So, be praying that everything works out just like God has planned it. C-section or vaginal delivery, I know God is going to have the whole thing in the palm of his hand and Davis and I will be protected and healthy and safe. I just feel at peace with it all. Tomorrow is my last day at work. I am feeling a little sad about leaving my students. One of them sent me an email saying that she thought they should open a hospital within the school so that I didn’t have to leave. They aren’t going to make it easy for me when tomorrow afternoon arrives. Since I have all next week off, pray that Davis will make a timely arrival so that I’m not left to think too much! 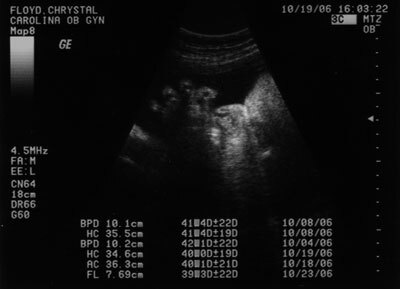 I was 9 pounds, 13 ounces when I was born, and my mom weighed 108 pounds when she first got pregnant with me. She didn’t have a c-section, just a regular delivery…and I was out very quickly…20 minutes after she arrived at the hospital! I’ll pray for a quick and painless delivery for you. Good luck!!! Your faith is strong and you have family and friends supporting you. Even if labor and delivery don’t go the way you hoped, the outcome will still be the same…Little Davis. Or should I say Hoss Davis? I can’t wait to see him! I was 9lbs and 12 ounces when I was born and Mama had me naturally. I think you will do just fine either way. You know I had a C-section and it really is not all that bad. I pray you will be fine either way. I just can’t wait till he gets here. Hoss is on the way. When i was getting ready for Joshua to arrive, i had my christain music packed, and ready to “push and go and get back to Loris” yelp, that was my tune! I started labor at 6 am, finally dilated to 6 cm. Around 6 p.m., I told the doc “i dont care how you do it, but get this baby out of me”. i probably sounded like the godfather, cause the doctor got closer to me and said what? and yes I, great in pain, repeated myself. At 9:46 pm. we had a 8 lb 2 oz boy after having a c-section! I have never had a vaginal delivery. If the doctor thinks a C-section is what is needed, then go for it. I do pray for a smooth delivery and safety, and that our Heavenly Father would direct all the staff that will be involved in bringing your son into the USA! I now await a phone call, ha! Previous Previous post: Woah – Is that what 35 pounds looks like?